The Paddy Brown Program (PBP) provides support and financial assistance to post-9/11 members of all branches of the U.S. Armed Forces offering the resources needed to transition back into civilian life. Built around a national mentorship program, PBP offers access to employment and professional development opportunities in the first responder sector. This is 3 Truck and we’re still heading up! are the last words dispatch heard from Captain Brown at 9:21am from the 35th floor of the North Tower. 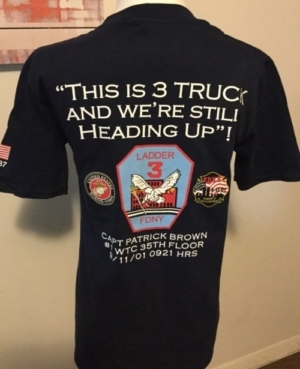 Carolyn Brown, Paddy’s sister and PBP Board Member, has graciously allowed us to sell t-shirts commemorating Paddy with 100% of profits going to benefit the post-9/11 veterans supported by the PBP Program. 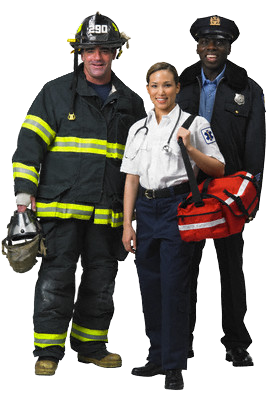 Do you dream of becoming a firefighter? Have you waited years for the opportunity to join the FDNY? The time is now! Learn the steps to becoming one of New York’s bravest. The FDNY exam will be administered this fall for admission to the FDNY academy. If you think you have what it takes and want to learn about the process, click here. The Paddy Brown Program is here to help veterans interested in taking the FDNY exam. We have experienced firefighters who have made the successful transition from military to fire service. If you are in need of assistance, please fill out the form at this link. PBP’s goal is to help transitioning veterans find employment in the first responder sector. Through our job search engine (powered by Indeed) you can search by location and keywords. Listed below is a sampling of what you will find through our job search. Attend community-related events such as Common Council meetings, School Board meetings, local police precinct community meetings, and the like…. 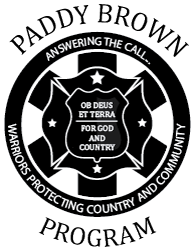 The Paddy Brown Program ® (Federal Tax ID 47-4518049) is a civilian 501(c)(3) tax-exempt nonprofit organization.